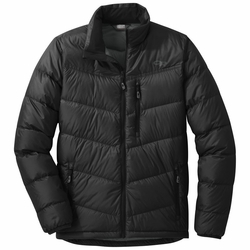 Outdoor Research Transcendent Down Jacket. The Transcendent series has been a long-time puffy favorite for climbers, backpackers, mountaineers, and everyone else who spends extended time outside. So OR took what you loved - and what you asked for - to create the dramatically redesigned Transcendent Collection. Injected with all-natural responsibly sourced down, the new Transcendent uses wider quilting and a rebalanced down fill to allow its insulation to loft better for fast, compressible warmth. Fresh, modern design lines and colors, trusted lightweight weather resistance, and feature-packed details add even more reasons for adventurers to rely on the Transcendent to excel in their sport. Even if you haven't quite loved your last puffy to death yet, we promise that the new Transcendent will make you reconsider retirement and upgrading to the latest and greatest.